The full title of Carter Phipps’ 2012 book is Evolutionaries: Unlocking the Spiritual and Cultural Potential of Science’s Greatest Idea. Drawing on the work of many writers and current thinkers, Phipps describes applications of the concept of evolution beyond biological science to economics, psychology, ecology and even spirituality and theology. The book is upbeat, future-oriented, and full of expressions like potentials, possibilities, creative capacities, and faith in the future. “Evolutionaries” are the revolutionaries who are peering ahead into this evolution-based future. I was drawn to the book by the linking of evolution with spirituality. But by the end, I was put off by its insistent optimism, disappointed by all the speculation, yet interested enough to reread sections of it. The book is organized into reinterpretations of evolution, science, culture, and spirit. Among the ideas expounded very clearly by Phipps: Biological evolution bears witness to the importance in all living things of cooperation as a means of survival. Collaborative governance and organization can be found in everything from DNA up through modern globalization. Stresses such as disease and war that threaten such cooperation ultimately lead to creativity and change. In this way, evolution takes one step back and two steps forward and keeps moving ahead. The concept of evolution as having a direction, an “arrow,” has been blasphemous in the past but is a truth that more thinkers today are willing to talk about. Carter Phipps is the current executive editor of EnlightenNext magazine. The second half of the book moves the discussion out of the physical and social realms and into those of consciousness and spirituality. Our individual and collective consciousness—the bits and pieces and thoughts that fill our heads—has changed in the last few thousand years. Each stage of consciousness builds upon and transcends the one that preceded it. This process will continue towards an “integral consciousness” in which concern for the wellbeing of the whole is paramount. In this process, human creativity and freedom will grow, giving people options but also responsibilities for the directions that they take. 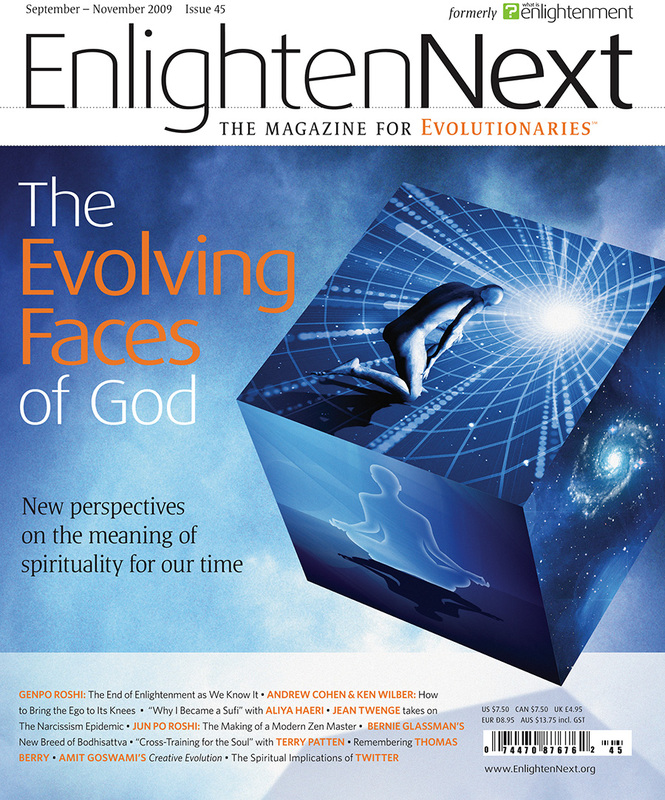 In the process of such “emergence” one can talk about spirit and God. Evolutionaries are not lone torches, shining brightly in an otherwise pitch-black night. They are part of a larger movement—a fledgling, unstructured, diverse movement, but one with great cultural promise and significance. I hope this book helps galvanize and unify those already shaping this field and inspire a new generation of Evolutionaries to see just how compelling, fulfilling, and culturally relevant the ideas at the heart of this emerging world view are. In the past century as [Pierre Teilhard de Chardin] predicted, we have taken up the tiller of the world. May nature’s exuberant creativity guide our hands. In pursuing our passion for the possible we will find the future of evolution. I was let down by this turn in the second half of the book towards the mission of steering the world into the future. I suppose it is because as I look to answer questions about my own life, death, and purpose, speculation isn’t good enough. History is better. If you want to understand something—a mind, a problem, a nation—you are better off studying its history than guessing its future. Phipps does indeed seem to feel “a need to find greater meaning behind it all,” especially meaning in the form of human achievement. He writes that humans are “the progressive edge of evolution as far as we know, the creative dynamics of the Earth come alive in human form.” The first half of this statement I can swallow; the second half turns us into semi-divine incarnations of mother earth. Don’t all species embody the “creative dynamics” of life? Has there been moral progress over the course of civilization, as Phipps argues? Yes and no. The spread of representative government and of legal process based on human rights has reduced levels of on-going violence and some types of suffering such as famine. But modern humanity has also achieved new heights of environmental destruction, the extinguishing of species, spasms of mass killing, and labor exploitation. As for the future, let’s wait and see how our morality holds up in the coming decades as we cope with climate change, the needs of a couple of billion more people, the relentless spread of guns, and the hardening division between the wealthy and the poor. Finally, the idea—or the implication–that evolution is moving towards a destination doesn’t strike me as obvious or inevitable. Evolution may indeed have a “direction” of sorts as new and brainier species appear and species themselves change, humans included. But a direction does not require a destination. Plenty of things move in a direction without having a destination: day and night, the seasons, time, clocks. Evolution is one of these, moving in the directions offered by variations among individuals that increase the odds of survival. It is possible, I suppose, that evolution might have a destination we don’t know about, some state of near-perfection millions or billions of years in the future. If so, that is not of much use to me. I’ll work with the 3.8 billion years of life behind me to help me make sense of myself and how I got here. This entry was posted in Cooperating and competing, misc., Morality, Religion, Surviving and thriving and tagged evolution, spirituality, the future. Bookmark the permalink.